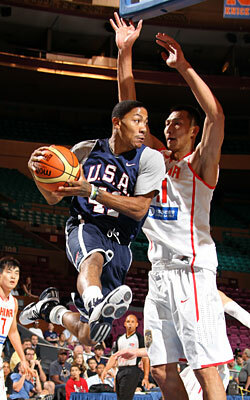 The 2010 USA Basketball Men’s National Team’s first taste of international competition—or any competition outside of their own team—came on Saturday afternoon with Derrick Rose and his teammates leaving Madison Square Garden with an dominating victory over China. The teams participated in a scrimmage, with four 10-minute quarters and a scoreboard that was reset at the end of each frame. The Americans won the first three quarters convincingly, including an impressive 35-8 third frame, before coming up short 17-16 in the final period. Rose, aiming to make the final roster of 12 players which beginning training in Madrid, Spain on Aug. 17 and compete in the 2010 FIBA World Championship in Istanbul, Turkey Aug. 28 to Sept. 12, scored 12 points and dished out two assists in the winning effort. The USA team, which has not won the FIBA World Championship since 1994, will look to take its first real step in doing so when it meets France on Sunday back at the Garden (12 p.m. on ESPN2). “I’m just trying to put pressure on my opponents and play well,” Rose said following the scrimmage, which opened the doors to a limited audience of about 500 people, including the Lakers’ Kobe Bryant, who sat in the first row near the American bench. Danny Granger led all scorers with 22 points, while Eric Gordon contributed 15 and Kevin Durant chipped in with 14. For Rose, the experience with the USA team has been different from what he is accustomed to, with more focus on transition play and fewer amounts of possessions, he said. USA coach Mike Krzyzewski seconded Rose’s thoughts following the scrimmage. As for Rose, Krzyzewski likes what he is seeing out of his fellow Chicago native. But he wants to see a little more of that swagger he knows is in the 21-year old point guard. “He’s been good, especially with his ball pressure,” commented Krzyzewski. “All of these guys sacrifice their egos to be on here, but we don’t want them to lose their egos. 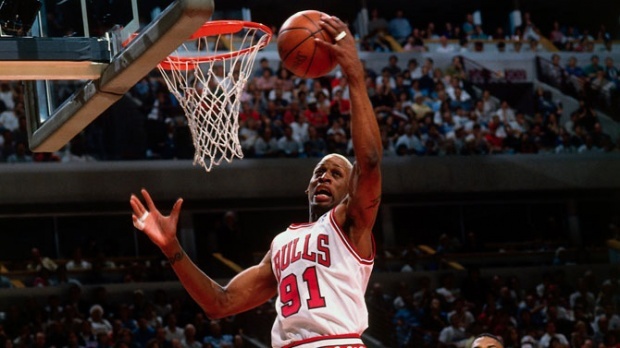 When he’s in the game, we want him to have a Bulls ego rather than just trying to fit in. That’s a little bit of a process. As Coach K mentioned, that process is indeed in effect. The group has been together since mid-July except for a two-week break prior to their New York arrival, and Rose said a strong sense of camaraderie is in the works. Rose stressed rebounding as the key to the team’s success, an area in which the team has a great deal of room for improvement. Krzyzewski echoed those comments and said that in the last week, extra emphasis has been added to rebounding. As for the final cut, Rose feels good about his chances. The fact that neither Jeff Green or JaVale McGee played Saturday could also be an indicator of two players who won’t be moving forward with the team.